I went to spend a day with a bunch of digital smart folks at this year’s Chief Digital Officer Summit. The annual gathering, hosted by CDO Summit founder David Mathison, has been going for eight years. It started back when the word “digital” was like “new” media: a thing that would happen in the future. It’s a distinction that the folks at EY (Disclosure: EY is a client of my company) explain as the difference between “doing digital” and “being digital.” Back then, folks were doing digital. And the Chief Digital Officer was a placeholder role to sort out digital for when it might arrive. Remember, before the iPhone? Back then. But now digital has definitely arrived. So the CDO summit folks rolled out a report showing the inexorable advance of the CDO into the CEO role. It was relevant, but not surprising. After all, if you’re a consumer packaged goods company, a services company — or, frankly, any business that needs to connect with customers — and you’re recruiting for a new CEO, would you hire a person who says: “Well, I’m not a digital person, but I’m going to hire a kickass CDO, and we’ll get it all sorted out”? What the CDO to CEO report said was that more and more CEOs need to BE DIGITAL. The role of planning and managing a digital roadmap can’t be pushed down the org chart. It needs to lead the company, with a digital-first worldview. Herman’s arrival at Bain is probably worth noting, as he was previously the CDO of The Media Kitchen, a digital agency spun out of Kirshenbaum & Bond — and an early lead in the shift that brought digital to the forefront for agency clients. But 2018 really is a watershed year. 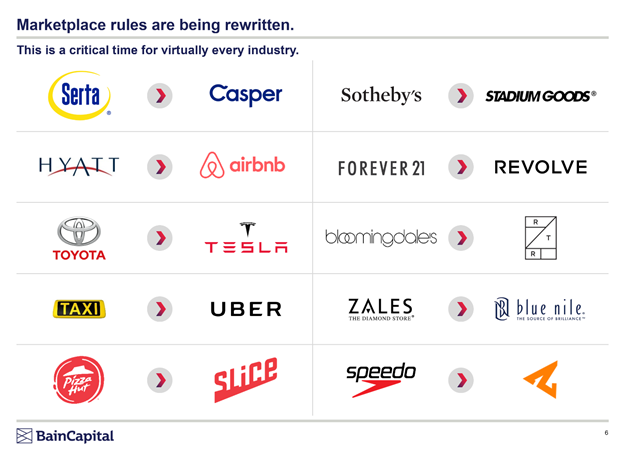 Herman showed the gathering a slide (shown above) of how digital is literally eating the lunch of old-world companies that don’t become digital fast enough: Serta mattress to Casper, Hyatt to airbnb, Toyota to Tesla, even Sotheby’s to Stadium Goods. The changing of the guard from physical to digital is dramatic. One thing becomes clear: Any business that allowed a digital business to reinvent their sector is going to have a hard time playing catch-up. The era of the CDO role as leading an organization — rather than servicing a brand — has arrived, and is only going to accelerate. At EY, the talk is of superfluid markets: industries where change isn’t a line in the sand, but rather an ongoing, fast-moving evolution. Digital does more than change how companies and customers interact, it changes the nature of the communication. Customers have more choice, more power, more control of their digital destiny. So, if they don’t get authentic, responsive, solution-oriented engagement from a brand or service, they simply move. There’s no penalty for changing insurance provider, cell phone company, or food kit-provider. Consumers are connected to a global network of services, offerings, and brands — with instant access and often next-day delivery. So, is your next CEO going to hire an awesome head of digital? I hope not. Because the clock is ticking. And if you’re not fully integrated in BEING a digital company by now, it may be too late. CDO=CEO in the world of fully engaged digital products and services. Anything less risks being the buggy whip manufacteer in the era of modern, connected consumers.